Ages ago, before we even moved into the house, I planned on doing our bedroom in greys, yellows and blacks. I knew I was going to paint the walls grey, the ceiling yellow, put up crown molding and have a grey bedspread. I've been looking for ages for an acceptable king-size bedspread that also didn't require a 2nd mortage. I happened to find a fuzzy grey one at Shopko for $30 not too long ago, more than 1/2 off. It's basically just a huge throw, but it works for me. I'm just happy it didn't cost $300. Eventually, I want to get lots of pillows and make a cheerful quilt to put at the bottom of the bed. I'm thinking I will probably even knit at least one of the pillows. So, the throw started a chain reaction. Mostly, I've just painted the bedroom and the bathroom grey. 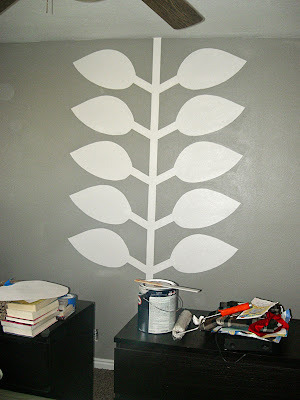 I had the idea forever ago to paint the wall opposite our bed with a huge white graphic vine leafy design, so as I painted the room, I had to work out how to do that too. I was pretty darn proud that I figured out how to get it even, with my low tech painter's tape and poster-board template. It's not perfect, but you all are not supposed to notice that, 'kay? 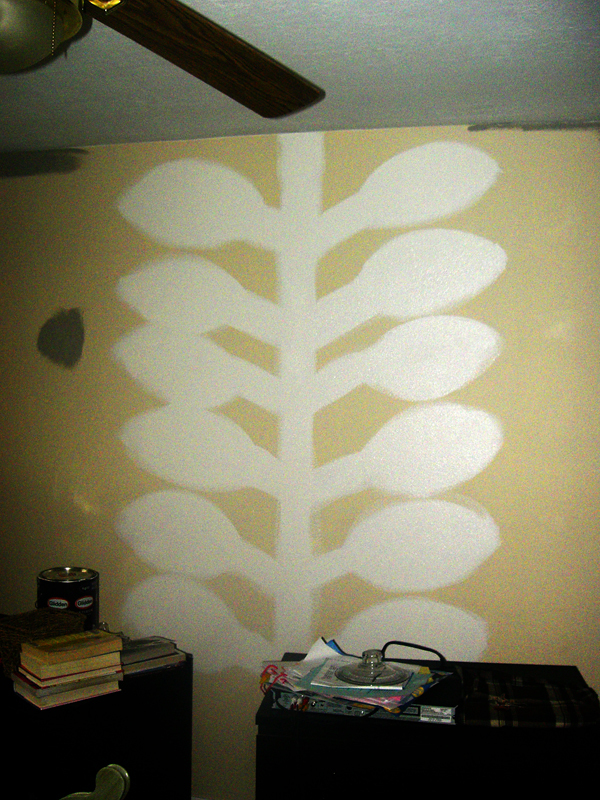 First, I did some rough white as an undercoat. Probably should have just bit the darn bullet and risked the cracked teeth and consequential dental work and painted the whole area white, because it would have saved me work in the end. You can see how pathetically uneven my leaves are here, so when I did the measured ones, parts of the tan showed through. 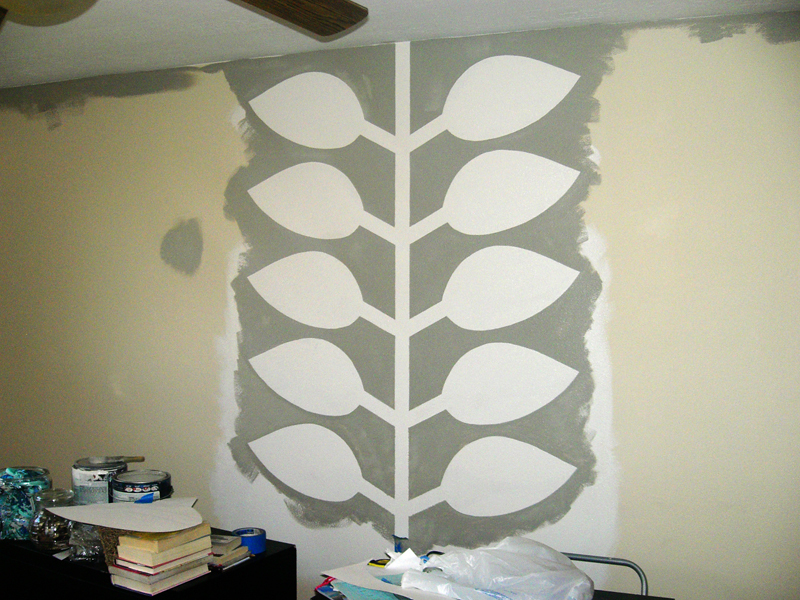 Eventually, David ended up filling in the whole area white for me for the bottom three sets of leaves. Then, I ran a level piece of painter's tape from ceiling to floor. It was of the 3" wide variety. Then I made a template for the angle of the stems, and measured off the spacing of the stems, and used painters tape again for the width. 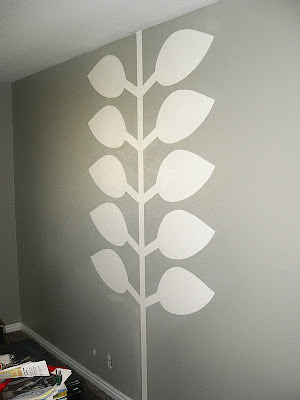 Then I made a template for the leaves (and extended the angle of the stems up onto the template so it stayed the same) and traced them on the wall and cut in the leaves in with a paint brush. Which was annoying, but not as annoying to me as trying to tape it off and having the tape bleed. And yes, the tape bled on the stems, so I came back with the brush to touch them up. I've heard about various methods to prevent this, but I've never had much luck with them--so rather than go through that, I cut in when I can and touch up when I can't . Maybe I need to buy better tape. All this was done between school assignments. When I couldn't stand to work on school anymore, I would paint. When I could stand to paint anymore, I would work on school. It worked well. David did all of the rolling, bless him. I don't like rolling much. I'm going to show the bathroom soon, which looks sooooo much better! I'm dying to make some curtains for the bedroom. I have a fabric picked out. I fought the idea of making curtains, but I shopped around and discovered the curtains, they are not cheap. This fact was previously unknown to me. I do not own a single curtain. So, I could have generic yellow curtains for the same price as fabulous, beautiful, graphic patterned curtains. Guess which one I am going to pick. Eventually. When I decide I want to spend $100 on curtains for my two bedroom windows. I could probably do yellow curtains for a lot less if I made them myself, but if I'm going to make them myself, I think I will do the amazing ones. This is really nice and inspiring. I'm dying to do my bedroom in shades of purples and browns, but am waiting to be inspired by a fabric before embarking on anything else. (At the moment, that includes cleaning.) The problem? All of the fabric that has brown in it is either pink or blue. My ultimate plan includes a quilt, curtains, and a knit blanket. We'll see if it ever happens! Very cool! I love the gray! Cool! 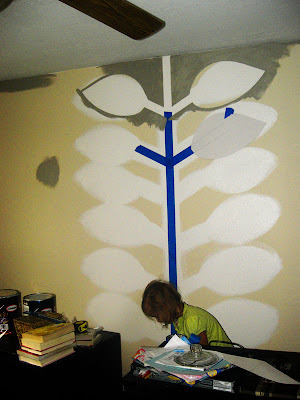 Ahh, I wish we were allowed to paint. I just noticed "explective" in the banner. Is that supposed to be "expletive"? I love the gray! I have to admit, that first photo, I thought was the finished product, and I was like whoa, Kara usually does better than that...and you did. lol. Love it. I love the gray! It looks great! I'm doing ours in plum and gray, slowly but surely. Oh Shaunte, oh dear, lol! I'm adding a disclaimer, because clearly, I did not make it obvious enough. I have to admit I sometimes cut corners, but that is soooo bad. :D Hehehe.